Effectiveness in today's workplace relies on how well people can pool their talents, resources, and knowledge to achieve results. It is their daily interactions that determine the ultimate success of a strategy or how well it is executed. Anton McBurnie has more than 20 years of hands-on experience successfully growing, turning around and managing companies all over the world. 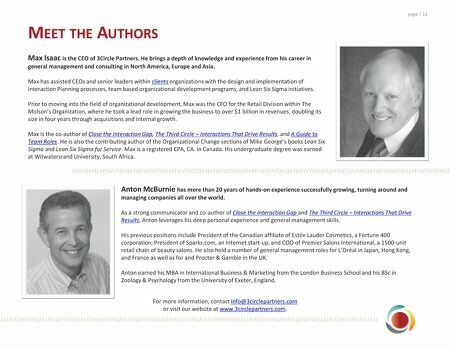 As a strong communicator and co-author of Close the Interaction Gap and The Third Circle – Interactions That Drive Results, Anton leverages his deep personal experience and general management skills. His previous positions include President of the Canadian affiliate of Estée Lauder Cosmetics, a Fortune 400 corporation; President of Sparks.com, an Internet start-up, and COO of Premier Salons International, a 1500-unit retail chain of beauty salons. He also held a number of general management roles for L'Oréal in Japan, Hong Kong, and France as well as for and Procter & Gamble in the UK. Anton earned his MBA in International Business & Marketing from the London Business School and his BSc in Zoology & Psychology from the University of Exeter, England. MEET THE AUTHORS / / / / / / / / / / / / / / / / / / / / / / / / / / / / / / / / / / / / / / / / / / / / / / / / / / / / / / / / / / / / / / / / / / / / / / / / / / / / / / / / / / / / / / / / / / / / / / / / / / / / / / / / / / / / / / / / / / / / / / / / / / / / / / / / / / / / / / / / / page | 11 / / / / / / / / / / / / / / / / / / / / / / / / / / / / / / / / / / / / / / / / / / / / / / / / / / / / / / / / / / / / / / / / / / / / / / / / / / / / / / / / / / / / / / / / / / / / / / / / / / / / / / / / / / / / / / / / / / / / / / / / / / / / / / / / / / / / / / / / / Max Isaac is the CEO of 3Circle Partners. He brings a depth of knowledge and experience from his career in general management and consulting in North America, Europe and Asia. Max has assisted CEOs and senior leaders within clients organizations with the design and implementation of Interaction Planning processes, team based organizational development programs, and Lean Six Sigma initiatives. Prior to moving into the field of organizational development, Max was the CFO for the Retail Division within The Molson's Organization, where he took a lead role in growing the business to over $1 billion in revenues, doubling its size in four years through acquisitions and internal growth. 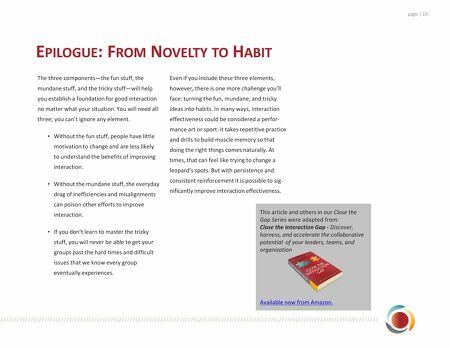 Max is the co-author of Close the Interaction Gap, The Third Circle – Interactions That Drive Results, and A Guide to Team Roles. He is also the contributing author of the Organizational Change sections of Mike George's books Lean Six Sigma and Lean Six Sigma for Service. Max is a registered CPA, CA. in Canada. His undergraduate degree was earned at Witwatersrand University, South Africa. For more information, contact info@3circlepartners.com or visit our website at www.3circlepartners.com.